Welcome to Jump N Splash, home of the best water slides in Texas! 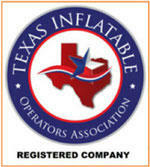 We want to make JumpNSplash.com your best choice for inflatable party rentals in the Houston Texas area. Here you’ll find a great selection of bounce house, water slides and other party rental equipment that is sure to make your next event a successful one. You can use the menu to the left to browse our party rentals by category, or click the quick order button at the top to reserve your date, time and equipment now! 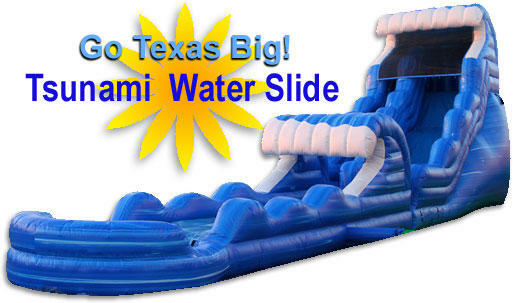 Houston's Largest Water Slide Rental! Ride the Tsunami all the way down! The 54ft Tsunami Water Slide is commercial-grade for extra durability, has a fun wave theme kids love, and is sure make your party, festival or event awesome this summer. The built-in ladder offers easy access, and the mesh tarp attaches at the top to keep kids safely in play on their way down. This water slide offers a adventurous ride all the way to the pool. At Jump N Splash we take our responsibilities as a safe rental operators very seriously. That's why you can count on your rental unit being cleaned and sanitized before it's arrival. You'll also want to know that we are fully insured, comply with all state regulations, and that we are inspected and licensed by the State of Texas. Concession Rentals & Fun Stuff! Go that little bit extra and add the fun food. Jump N Splash has a great selection of concession rentals like popcorn machines just like at the theater, or a cotton candy machine to create a State Fair midway. 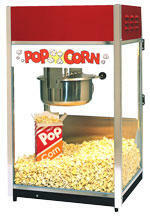 You'll also find other great rentals like our inflatable throne and even a real Sno-Kone machine! Great for the hot summer days. 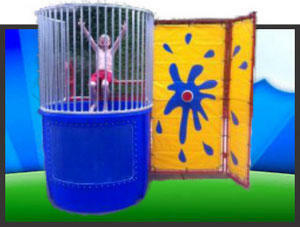 Dunk Tanks; The Ultimate FUNdraiser! Everyone likes taking their chance at hitting the Bulls-eye and dunking the principle, coach, or better yet, the Mayor of their community. It's all in fun and it's been a longtime favorite in carnivals, and events across America. 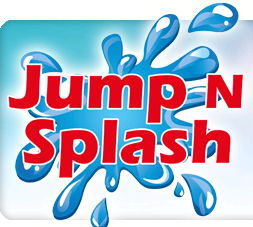 Jump N Splash is ready to make a splash on your next event with one of our great Dunk Tank rentals. It's a great money maker for schools, booster clubs, church groups, or any other organization. You can bet it would be a favorite a company picnic!